An article by Brad Plumer on the Washington Post website credits the 30 percent designation to the international financial house Credit Suisse. They in turn assign this number to individual consumer purchases alone, without factoring in fleet or commercial sales. Remarkably, despite the number of new car sales in the US last year, the average age of vehicles on the road went up last year – a clear indicator that new car sales will continue to improve in 2013. What is truly striking is nearly as many cars were recalled last year as were sold in the US – 14.3 million. Do the math – the automakers only sold 200,000 more cars than were recalled last year for everything from faulty fasteners to steering problems and fire hazards. All the recalls had little if any effect on sales though. Even though Toyota and Honda recalled 8.4 million cars between them in 2012, both increased their market share by 17.3 and 25 percent respectively. Toyota’s recalls included 2.5 million vehicles and numerous model lines from 2007 to 2009 for power-window issues, nearly 800,000 RAV4 and Lexus HS 250h models for suspension issues and 670,000 Prii for steering ailments. Honda recalled over 800,000 Honda Pilots, Odysseys and Acura MDXs for ignition switch problems, 572,000 Honda Accords with faulty power steering hoses and 820,000 Civic and Pilot models for possible low-beam headlamp outages. In 2011, both Asian brands had trouble with supply issues caused by the Japanese tsunami, but they weren’t the only ones with recall and quality issues. General Motors recalled 1.3 million vehicles while Ford had to modify another 1.1 million. It’s hard to name a single manufacturer who did not issue a recall for one thing or another in 2012, but none of that seemed to affect auto sales in the US. The Washington Post cites a study by North Carolina State University stating Toyota’s highly publicized issues the allegations of unintended acceleration had no measurable impact on the brand reputation. Most pundits agree that since many consumers put off buying new cars during the first years of the recession, the average life of the cars on US roads created a pent-up demand that found expression this year. However, despite the sales boom the age of cars has gone up to over 11 years, from 10.8 years in 2012. That’s a good sign for 2013, in that as the economy continues improvement, auto sales will continue to drive the engine of commerce. This is likely to happen despite the determined efforts of our Congressional lemming faction to plunge en masse over the fiscal cliff. 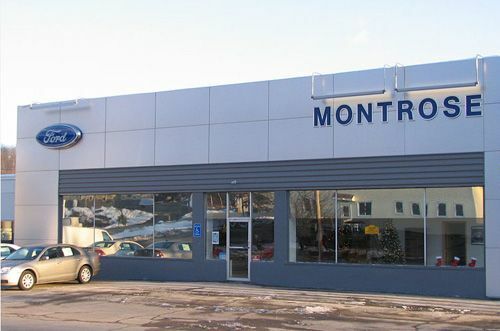 Image source: Montrose Ford Auto Dealer Date 10 December 2011, by S.MacMillen licensed under Creative Commons CC0 1.0 Universal Public Domain Dedication. I wonder what the Commonwealth of Mass will do with the 6.25% collected on every new vehicle vehicle sold and the towns will do with with the 2.5% excise tax on all the new registered vehicles? Not to mention the plate fees, registration fees, and of course the all-important new car safety and emmissions test fee. Maybe give it all to the MBTA? From what I've read about some towns in New England, maybe they'll build charging stations, then again it might be put into other fund raising and safety efforts like red light cameras and photo radar. Your guess is as good as mine.